Lily Collins (born 18 March 1989 in Guildford, Surrey, England), is an English actress, writer, model, and daughter of musician Phil Collins. She starred in the movies The Blind Side, Abduction, Mirror Mirror, The Mortal Intruments: City of Bones, and To the Bone. 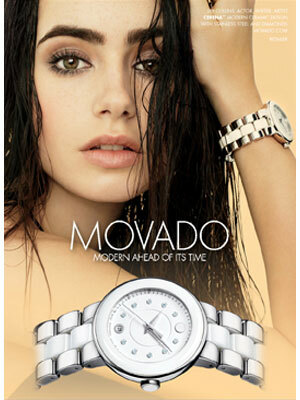 Lily Collins is featured in Movado watch campaign (2012).